This Scrapsadelic Frutti Tutti Mandala square is part of the Scraps Of Yarn Mini Crochet Along Series. We all have those little balls of left over yarns that most of the time make up for a huge amount of our stash! Although there are plenty of left over yarn projects readily available – I thought I would create a series of patterns that could be done in less than a day but can also be converted into larger optional projects! Pretty yet functional items to decorate, gift or use! Scrapsadelic Frutti Tutti Mandala Square! This pattern can be adapted and converted into several projects! Suggestions and ideas will be given! *work 3 DC; CH 1 into ring. *work [3 DC; 1 CH; 3 DC] into NEXT 1 CH space. CH 3; work 1 SC into NEXT 1 CH space. *work 4 DC into NEXT 3 CH space; CH 1. Repeat from * 10 more times. Fasten off and weaves in ends. *work 1 SC into next 4 DC; work FPDC over RND 3 SC. Repeat from * 10 more times. (12 x FPDC; 48 SC). Optional: First project complete – these first 5 rounds make a lovely coaster! Make in assorted colors to make a set for yourself or to give as a gift! Or continue onto Part 2! *work [3 DC; CH 2; 3 DC] into NEXT FPDC. *SKIP 3 DC; work [3 DC; CH 3; 3 DC] into 2 CH space; SKIP 3 DC; work 1 SC in-between next two petals. CH 3; SKIP NEXT 3 DC. Repeat from * 10 more times; SL ST into first SC worked. Optional: Second project complete – you now have a pretty Flower doily if you wish to stop here. Or if you would like to try something unique and different. Either get a canvas that’s already printed or paint (if you have that extraordinary talent) and attach your Flower Doily! Or continue onto Part 3! RND 9: join new color (pink – although in the photos it looks like purple) with an SC into ANY 3 CH space between 2 SC; CH 4; work 1 FPDC around next SC; CH 4. *Work 1 SC into next 3 CH space between 2 SC; CH 4; work 1 FPDC around next SC; CH 4. Repeat from * 10 more times. SL ST into FIRST SC worked. RND 10: CH 1 (does NOT count as a stitch); work 1 SC into same ST; work 4 DC into NEXT 4 CH; CH 2; SKIP FPDC; work 4 DC into NEXT 4 CH. *Work 1 SC into NEXT SC; work 4 DC into NEXT 4 CH; CH 2; SKIP FPDC; work 4 DC into NEXT 4 CH. CH 4; SKIP 4 DC; work 1 SC into 2 CH space; work 1 FPDC around RND 9 FPDC; work 1 SC into 2 CH space; CH 4; SKIP 4 DC. *Work 1 SC into NEXT SC; CH 4; SKIP 4 DC; work 1 SC into 2 CH space; work 1 FPDC around RND 9 FPDC; work 1 SC into 2 CH space; CH 4; SKIP 4 DC. Optional: Third project complete – at this stage the mandala makes great dishcloths or potholders! Just remember that cotton/kitchen cotton works best for this! Or continue onto Part 4! work 1 DC into next FPDC; CH 4. Repeat from * 2 more times. SL ST into 4 CH of 4 CH. work 1 DC into next 3 TR. Optional: Fourth project complete – at this stage you now have the mandala square! You can make more to create a blanket/throw or use it for smaller projects like to create a bag or embellish one! If you are interested in the pattern for the bag in the photos you can find that here! Or continue onto Part 5! then Repeat from * to ** once more. CH 3; work [1 SC; 3 CH; 1 SC] into next 4 CH corner space. [CH 3; work 1 SC into next 3 CH space] 14 times; SL ST into first SC worked. Repeat from * to ** 6 more times. Work instructions between ( ) 2 more times. SL ST into FIRST SC worked. Optional: Fifth and final project complete! 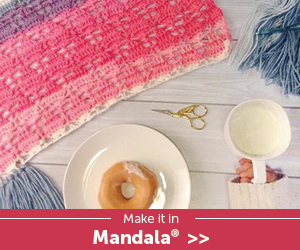 Leave as is for a pretty table doily or make more to make a beautiful throw or blanket! This is a photoshop image created to give an inspired look of what a blanket could look like! What will you do with YOUR mandala square?